INDUSTRY.co.id - Balikpapan - The Minister of Energy and Mineral Resources (ESDM) Ignatius Jonan is still waiting for the investigation result from the investigation team on the leakage case owned by PT Pertamina (Persero) in Balikpapan Bay, East Kalimantan. "I am waiting for the results of the investigation team made by the Police, the Ministry of Environment and Forestry (KLHK) and the PNS investigator of the Directorate General of Oil and Gas," said Jonan on a working visit to Balikpapan on Thursday (26/4/2018). 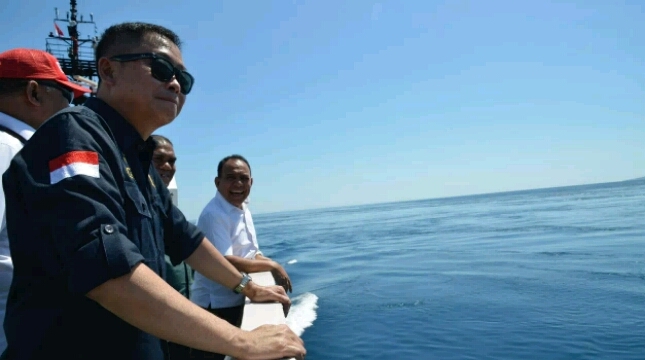 Jonan asserted, the Government has not been able to take legal action on the occurrence of an oil spill in Balikpapan Bay waters before knowing the results of the investigation. "Hydrographic and Oceanographic Center Navy (Pushidrosal) has provided input to the investigation team, well this is waiting for the results," said Jonan. On the other hand, Pertamina will be fully responsible for the condition of the oil spill. "We have done the countermeasures, if there is a replacement and recovery we do, we are responsible for everything," said Budi Santoso Syarif as Pertamina Processing Director. To see the current condition, Jonan moves to a closer look at the waters of Balikpapan Bay. From Jonan's observation, it appears that the condition of the waters is relatively clean. No more black oil spills floating on the surface of the water. As is known, Pertamina's oil pipeline leaks at a depth of 20 meters on March 31, 2018. The pipe runs from Lawe-Lawe, North Penajam Paser District to Balikpapan. Due to the breakdown of the pipeline, the pollution of crude oil around Balikpapan Bay, East Kalimantan.